Green Monday is a social enterprise that promotes vegetarian diets by cooperating with restaurants, schools, hospitals and other enterprises. Vegetarian diets have been widely recognised to provide both health and environmental benefits. “Green Monday” is an ingenious way to get non-vegetarians to start thinking about eating a vegetarian meal once a week. It publishes meat-free menus and recipes, hosts vegetarian cooking classes and provides educational talks on diets and nutrition. 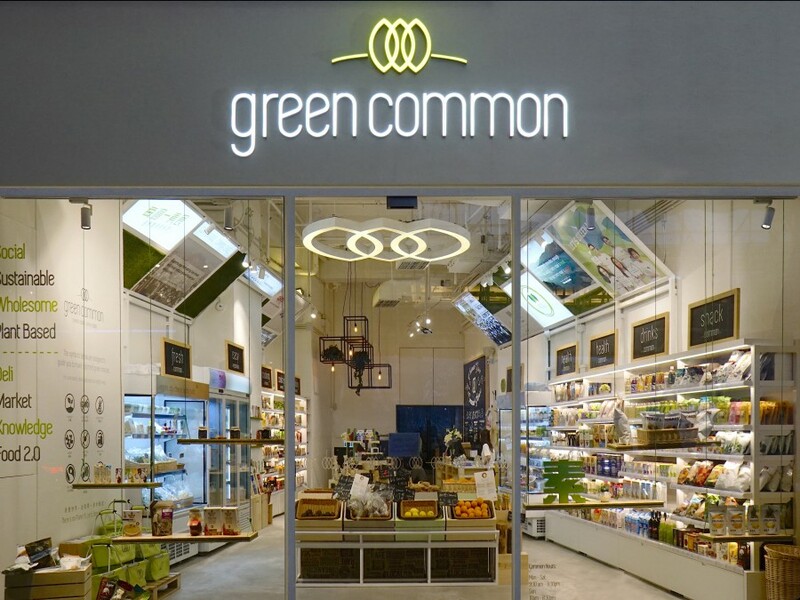 Recently, they expanded their business to retail, opening a vegetarian supermarket in Wanchai called Green Common. I dropped by one afternoon to check it out. The decor is minimalist and cool. Organic vegetables are prominently displayed near the entrance. Some of the produce is locally sourced. Shelves inside are full of vegetarian products － gone are the days of vegetarian food being bland and uninteresting. The wide array of ingredients and seasonings from all over the world lets you experience vegetarianism without sacrificing flavour, nutrition or variety. It also caters to the many office workers nearby by selling vegetarian sushi and cold noodle lunch boxes. Unfortunately, since I stopped eating take-away food for a number of years (because I don’t want to create unnecessary plastic waste), I was unable to try any of the yummy looking vegetarian meals. In addition to vegetarian food, there are healthy drinks. In the display fridge, are fresh fruit juices in plastic bottles ($28 for 250ml) and coconut water in glass bottles (not sure why coconut juice needs to be bottled when it comes naturally in a perfectly good container). This brings back memories to when I used to work in this neighbourhood. At that time, there were many fresh fruit juice stands on this section of Queen’s Road East. After lunch, I would buy a freshly squeezed fruit juice from one of these stands ($6 per cup). Time flies and a decade has since passed. With Urban Renewal projects, all the fruit juice stands were eliminated to be replaced by vendors that could afford higher rents. However, you don’t have to buy a drink at Green Common – they offer filtered Water for Free if you bring your own bottle. It used to be very difficult to refill your water bottle on this part of Queen’s Road East. You actually needed to go up to the 9th floor of the Social Welfare department headquarters or the 23rd floor of the senior citizen centre to find a water dispenser. The irony is that while the Social Welfare department understands the public’s need for free drinking water, the Environmental Protection Department’s Resource Centre located on Queen’s Road East (opposite of Green Common) doesn’t realise that they can reduce plastic waste simply by installing a water dispenser. Fortunately, Green Common is bearing its social responsibility by offering filtered water for free to the public (no purchase required). We really hope that there are more enterprises and organisations that will do the same. I like the Green Monday’s idea a lot. It’s a good initiative to implement worldwide! I also write a blog about sustainability and I recently published one about a zero-waste supermarket, so hope Green Common also has it mind on it. Apart from that, excellent post and blog, as well. Nice to have found you, you have a new follower! Previous Previous post: GM Foods Part 2: A Tool We Can’t Turn Away From?